From the Family record click the Payment button and enter the Payment amount in the Payment Transaction Entry window. The EMV terminal display will read "Please swipe or insert card", insert the card and enter the amount using the virtual terminal keyboard on your screen NOT the terminal keypad. On the terminal display, confirm the payment processed. The terminal will give you the option to print a receipt. The receipt will be sent to the printer you assigned when you Set Up Your EMV Card Terminal (Payment Gateway Swipe options). Back in the Jackrabbit Payment Transaction Entry window apply the payment to the fees it paid and click the Use Terminal Payment button. Jackrabbit will search for terminal payments with the same amount and will display them. In the Select Terminal ePayment window choose the correct payment and click Use Selected ePayment to link the terminal payment to the family's payment in Jackrabbit. The transaction Response (status) is then displayed, click Ok.
You will receive confirmation that the payment was created, click Ok. The transaction is added to the Family record Transactions tab. 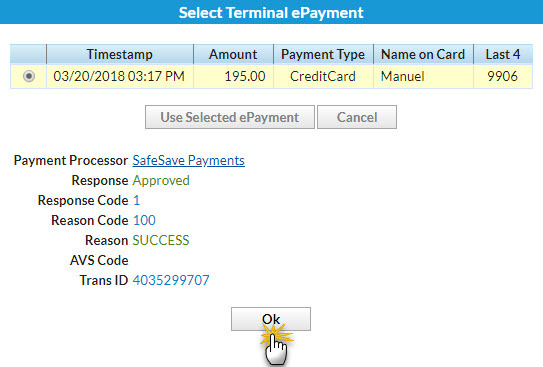 Click the status icon in the ePmt column to see the response information and the transaction ID. If you have any issues using the EMV Chip Card Terminal, please email eCommerce@jackrabbittech.com. An ePayments Specialist will be happy to help you!